It’s the season to be grateful, and recruiters are too often the unsung heroes within an organization. From job description to offer letter, recruiters make hiring a new candidate seem near effortless, even though we all know it’s not! 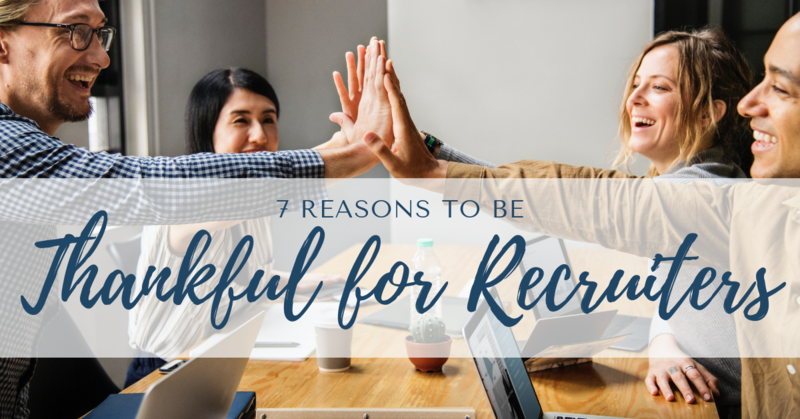 Here are seven reasons why we’re grateful for recruiters. Recruiters are in charge of making your company attractive in the first place, and this is much easier said than done. Recruiters help create the perfect job descriptions, they know where to market their company’s openings, and they connect employers with the ideal candidates. All of this work means that not only do recruiters get lots of applications for your openings, they get quality candidates. Something that people don’t always think about when hiring someone new is that candidates are potential coworkers. Recruiters help find people who are as good of a culture fit as they are qualified. This way, from day one, your team has a new coworker who will be good at their job as well as pleasant to work with. A bad fit is a bad hire and costs an average of $9,000 per day according to the Harvard Business Review. Because recruiters are the main point of contact for candidates, they’re usually in charge of offering jobs to chosen candidates. After all the interviews are said and done, it's their role to convince great talent to join your company. Making an offer is stressful because the candidate is no longer the one trying to impress the company-- the roles are now reversed. So you’ve found the perfect candidate, and they’ve agreed to take the job! The last step is negotiating pay. This is always a bit uncomfortable for both parties to navigate, but recruiters do the work of ensuring the new candidate is paid fairly, but not excessively. We can’t thank recruiters enough for all their work, and our goal is to make their lives as easy as possible. Check out our background screening services that will take the stress out of recruiting.